One of Nigeria’s leading rappers and label owner, Olamide, might have broken the hearts of many willing young talented female artiste who are willing to join his YBNL soldiers as he revealed that, he won’t be signing any female artiste to the label at this point. 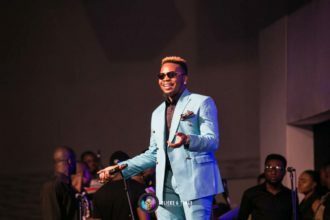 Olamide who has cemented his place as one of the most energetic and passionate acts in the history of contemporary hiphop music in Nigeria with 5th studio albums in 5 years revealed this during an interview with Hip Tv recently. According to Olamide, he won’t be signing any female artiste for a while because he is of the opinion that female artistes tend to have a short life span in the Nigerian music industry. The singer who lost his father a couple of days ago, has on his label successful male artistes like Lil Kesh and Adekunle Gold who are doing well for themselves. He finally gave a lifeline to the willing female act by adding that the only reason he will ever sign a female artiste was if she has hunger for success as he does. Olamide’s record breaking 5th studio album in 5years ‘Eyan Mayweather’ is doing well on the streets as it beats Adele’s ‘Hello’ to the number one spot on iTunes.